Crystal City, Texas, is a small town in a sandy, dry prairie near the Mexican border. Its only claim to fame is spinach. The sandy soil turned out to be fine for growing spinach and a statue of Popeye stands across from the city hall. It also turned out to be a fine place for an internment camp for Japanese, German and Italian immigrants and their American born children. After December 7, 1941, new words entered America’s vocabulary . . . spies, saboteurs, krauts, yellow devils. Sumi Utsushigawa was nisi, born in America. Her parents were isseis, born in Japan. Although friends and neighbors were being arrested every day, Sumi’s father wasn’t worried. “This is America,” he said. “They don’t put innocent people in jail here.” In March the knock on the door came. Ingrid Eiserloh was born in New York. Mathias Eiserloh, her father, was born in Germany. He was a structural engineer and worked for Pittsburgh Plate Glass Co. The family lived in Strongsville, Ohio. The FBI took Mathias with no explanation in January of 1942, confiscating letters, photographs, paintings, and books. 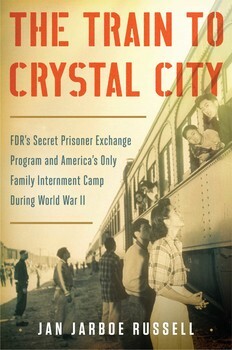 Ingrid didn’t see him again until they were reunited in the camp in Crystal City two years later. Based in part on interviews with survivors of the camp, this is a well-researched book that reveals a little known event in the history of World War II. It reads like fiction, but is uncomfortably true. It is a book I couldn’t put down, and a book I highly recommend, especially for teens who may not know what happened in America during that war. This entry was posted in adult, historical fiction and tagged Internment camp, World War II. Bookmark the permalink.